There is absolutely no shame in buying ready-made meatballs from the super-market. Everybody needs a shortcut during working days. "You have to pick your battles", is becoming my everyday mantra against petty arguments and negativity, but is also the sound of reasoning in my quest to cook something fresh, everyday! 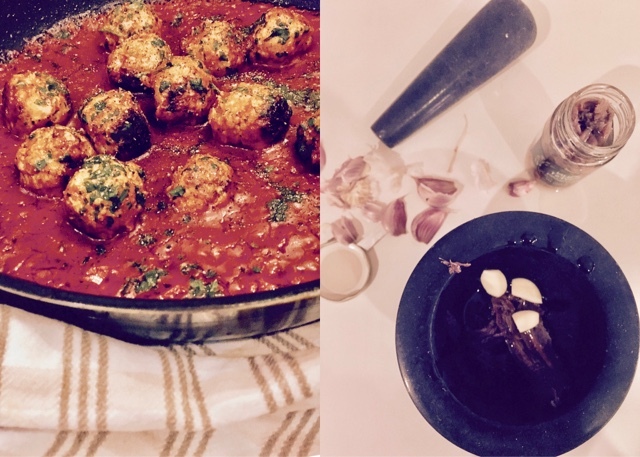 I've always preferred freshly cooked meals over ready-made food and horrible takeaways - I'll take a fresh omelette over, say, Chinese takeaway, every single time; so my little shortcut is to buy the meatballs and add tonnes of flavour in the velvety, red, zingy sauce. 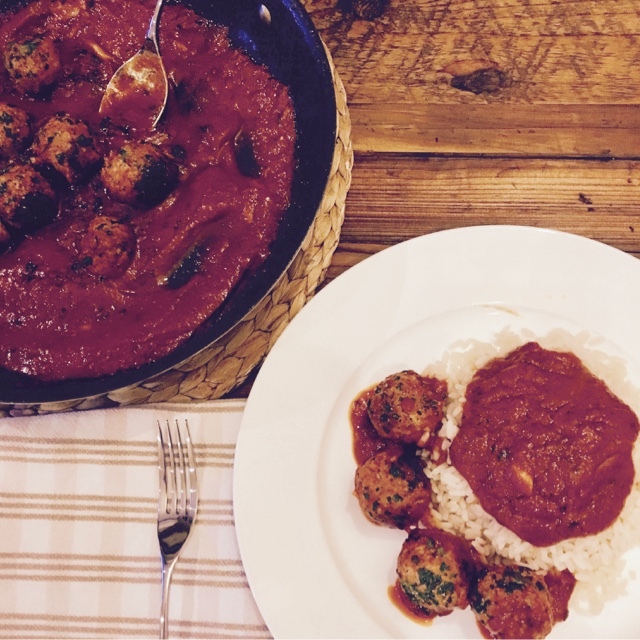 Turkey mince is lean and healthy but needs loads of enhancements, hence if you'd make the meatballs from scratch, you'd have the chance to add lovely herbs and spices for flavour, but since they are already rolled, count on the glorious red sauce to add a bit of zing. Fry the meatballs in a shallow, dry frying pan, for 5 minutes on each side, until they are brownish. Cover with a lid in between turning them, to maintain the moisture, turkey meat dries out easily. Remove the meatballs from the pan and set aside, covered. In a mortar mash together the garlic and anchovies until you have more or less a thick paste. Don't worry if there are still some small anchovy pieces, they add to the overall texture. In the same pan that you used for the meatballs earlier, warm up the olive oil on medium heat and add the anchovy-garlic paste. Give it two minutes to warm up throughout, you don't want it burnt. Add the cinnamon powder to the pan and take a deep breath in, the smell will tinkle your nostrils; that's what home-made food is all about! Give it a minute or so and add the tomato passata, stir, add a pinch of salt and cover for 10 minutes over medium-low heat. You can taste for more salt later, truth be told turkey mince does need a bit more salt than what you'd usually use, however your sauce is anchovy-based, so go slowly. 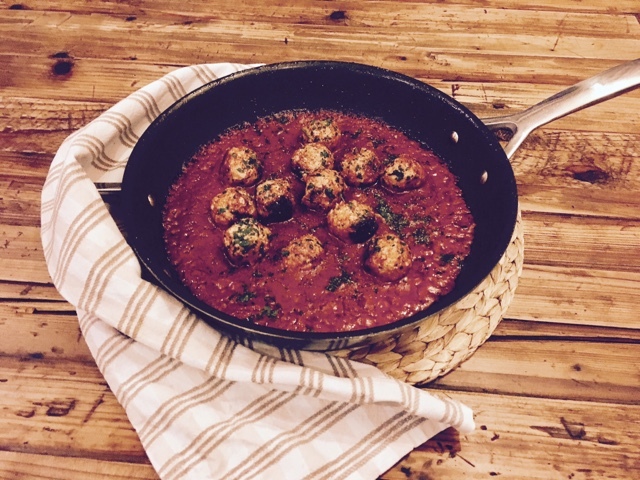 After the tomato passata has had a chance to cook down a bit, position the meatballs in the pan and give the frying pan a gentle swirl, to coat the meatballs in the sauce. Cover with a lid for another 5 minutes. You are done! To serve, squeeze the lemons over the meatballs, some fresh cracked black pepper and scatter the parsley all over - it's not just for decoration, the parsley actually adds on a fresh crunch, alongside the lemon. I like bringing the pan to the table, it's just so cosy and you can scoop the sauce out with a piece of crunchy bread! Have you invested in a pestle & mortar yet? They are addictive, so useful! Once you have it on your kitchen counter you'll find a million excuses to get your frustrations out, erm...I mean to bash, crush and thrash sweet fragrant out of cardamom and fennel seeds to spice up tea and syrups, then on to lemon zest and rosemary for your chicken roast...you'll use it more and more once it's there. Use small, firm movements for the crushing and don't forget to use the pestle to "stir" the ingredients, by pushing them on the outside walls of the mortar, that's a little trick for finer grounding of dry ingredients.